Rolex Yacht-Master mens steel platinum 40mm pre owned watches feature platinum bezels with stainless steel bands. We think you’ll agree, wearing this watch on your wrist will put you in distinctive company. In addition, BeckerTime offers a 30-day money-back guarantee, as well as a Lifetime TradeUp Guarantee for qualified items. We strive to deliver a first-class buying experience and 100% customer satisfaction. So, let us help you find that perfect style. Therefore, don’t hesitate to contact us if we can assist you. 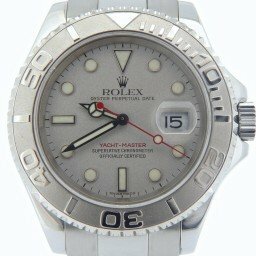 Among all the different Rolex Yacht Master models, it’s the stainless steel and platinum Yacht-Master that’s the most popular. In fact, it’s the only remaining version from the 1990s Rolex is still manufacturing today since both the solid yellow gold and two-tone yellow gold and stainless steel models are no longer in production. Here are four fast facts about the steel and platinum Yacht Master to consider. 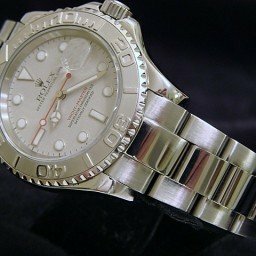 When the stainless steel and platinum Yacht Master made its debut in 1999, it was the first time that Rolex had combined both those materials in one watch. And in true Rolex fashion, the brand gave that combination a special name—Rolesium. While the combo of steel and 18k gold is labeled as Rolesor in Rolex-speak, Rolesium is the marriage of 904L stainless steel and 950 platinum. Rolesium is actually exclusive to the Yacht Master collection. On the Rolesium Yacht Master, the case and bracelet are crafted in steel while the bezel with raised numerals is in platinum. There are also some versions with a platinum dial for even more luxuriousness. The first steel and platinum Yacht Master watches were available in three sizes. There’s the men’s Yacht-Master ref. 16622 at 40mm, the midsize Yacht Master ref. 168622 at 35mm, and the ladies’ Yacht-Master ref. 169622 at 29mm. 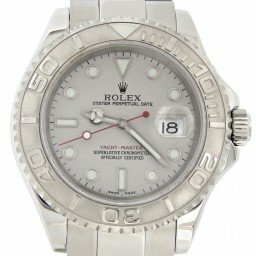 Then in 2012, Rolex updated the men’s steel and platinum Yacht Master 40 with the ref. 116622. This particular model is still manufactured today. Four years later in 2016, Rolex introduced a completely new size of the steel and platinum Yacht-Master with the 37mm ref. 268622. The new Yacht Master 37 replaces the previous 35mm and 29mm versions. For those two latter sizes, the secondary market still has them available. While all Yacht Master models feature three center hands and a date window at three o’clock, depending on the model, there are three different movements within the steel and platinum Yacht Master lineup. The 40mm versions run on Cal. 3135, the 29mm and 35mm versions run on Cal. 2235, and the 37mm versions run on Cal. 2236. Of course, all the above calibers are in-house automatic mechanical movements certified by COSC. 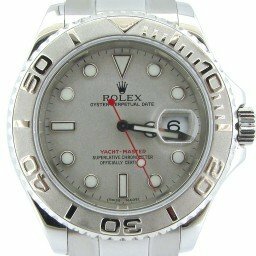 Like so many Rolex sports watches, when the steel and platinum Yacht Master came out in the late 1990s, it was a huge hit. So much so that waitlists quickly formed at boutiques around the world—some years-long! In addition to regular Rolex fans, the Rolesium Yacht Master was especially coveted by celebrities too. From actors like Brad Pitt, Charlie Sheen, and Bruce Willis to celeb chef Emeril Lagasse to musician Phil Collins, the steel and platinum Yacht Master is a must-have within the A-list set. Although unexpected, the ruggedness of stainless steel pairs remarkably well with the preciousness of platinum. However, with Rolex at the helm of this unusual match, it’s not surprising really. Taking nautical inspired looks and combining it with the technical superiority of Rolex in-house automatic movements, the steel and platinum Yacht Master continues to make waves almost two decades after its release.